A team of researchers from France and the U.S. has created a computer simulation of the development of the solar system focusing on Jupiter and the origins of its moons. 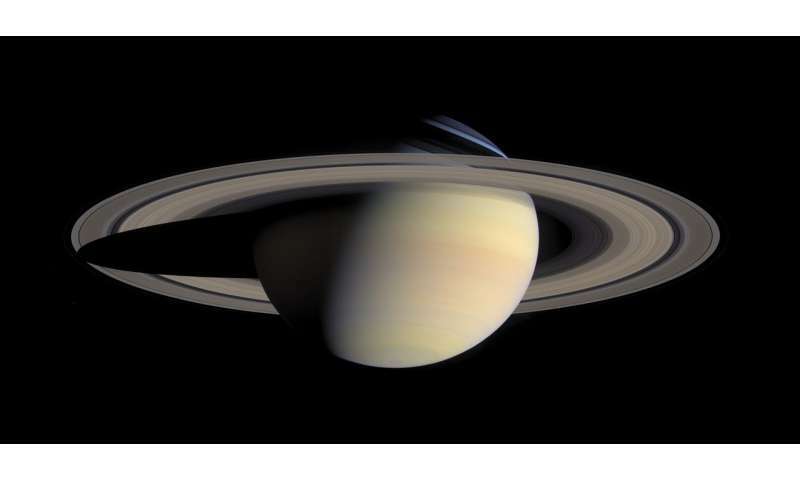 In their paper uploaded to the arXiv preprint server, the group describes the simulation showing that Saturn may have played a role in the creation of Jupiter's largest moons. Most space scientists agree that most, if not all, of Jupiter's smallest moons came to our solar system from elsewhere—on the other hand, the four largest moons, Ganymede, Io, Callisto and Europa are believed to have originated near the planet itself—but, as the researchers with new effort note, there is a problem with this theory. How could they have formed from nearby material if Jupiter cleared a track around the sun, as theory also suggests, via gravitationally attracting everything in its path as Jupiter formed? To learn more and possibly solve that problem, the researchers built a computer simulation to show what might have happened as Jupiter and other nearby planets formed. The simulation showed, the team reports, that Saturn may have played a role in the creation of Jupiter's moons by moving close enough to Jupiter to disrupt material orbiting the sun at the edges of the path cleared by the larger planet—causing some of the material to enter that cleared space. That material, the simulation further showed, could have coalesced to form the four large moons that we see today. If further study backs up the simulation, the group suggests, their findings may have an impact on the study of other solar systems—those that have many planets, they note, might have undergone a similar process. In such cases, scientists might want to take a closer look at the larger planets to see if they also have large moons that could be harboring life. The simulation suggests a plausible scenario surrounding the development of Jupiter's larger moons, the researchers note, but it still does not explain why those four moons are made of different kinds of materials—it would seem logical to assume that they would be very similar in makeup if they all coalesced from roughly the same pool of rocks, dust and gas.